Large or small, a walk-in closet is a room all its own. Being able to see your clothes and accessories at a glance, one season at a time, makes getting ready every day a breeze. 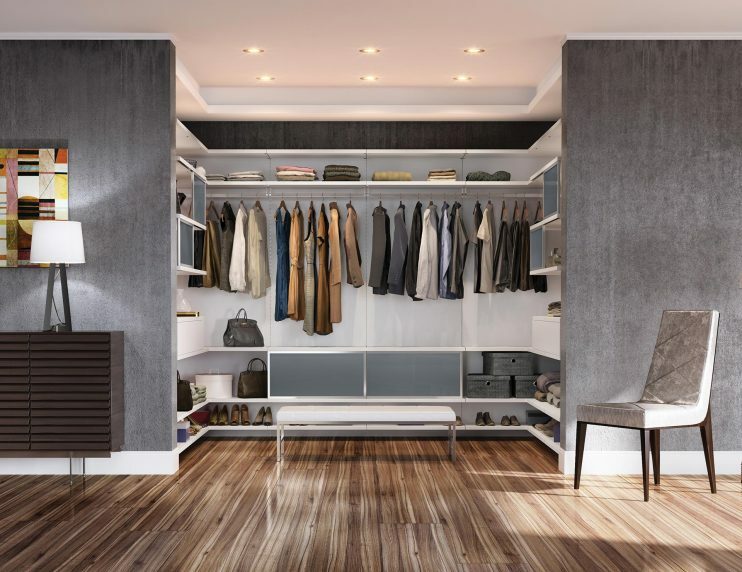 And with so many design options—like accent lighting, beautiful hardware and smart accessories—it’s like dressing in your own personal boutique. Design details such as decorative hardware and glass shelves personalize the space to make the closet truly your own. Designated shoe shelves and jewelry drawer inserts create smarter and more accessible storage. A centre island, a bench seating area, and deeper drawers all impact the improved functionality of a space. Our drawers feature dovetail construction, undermount slides, and quiet, soft-close mechanisms to ensure superior quality and a lifetime of use. 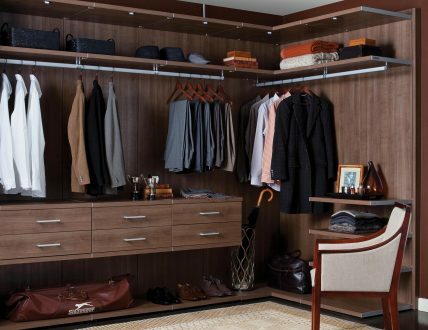 A custom, walk-in closet provides space-saving options, including multiple hanging areas, adjustable shelving, drawers, baskets, and hampers. Lighting increases functionality and accessibility, dramatically enhancing the aesthetic of a simple design. Options include LED, puck, and ribbon lights with multiple switching choices. 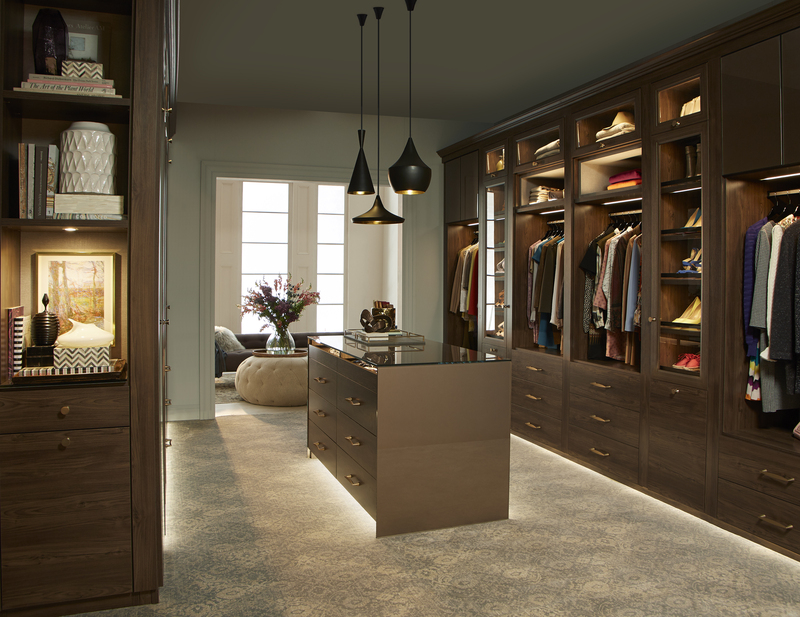 From spotlights over display shelves to a lighted shoe closet, lighting can transform a spacious closet into a personal boutique. Optional decorative moldings and details further customize the overall look to make the space feel like a built-in feature within your home. Pull-out accessories such as belt, tie, scarf, and valets maximize space and organization. 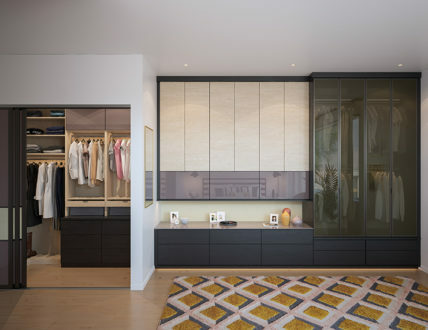 Maximizing storage in a chic way – and hiding it all from view with sliding doors – this sophisticated setup starts with a small step-in closet, then expands to a floor-to-ceiling wardrobe. Semi-concealed glass doors offer at-a-glance visibility and LED lighting adds a soft glow. Clean and light, this master closet is ideal for shared spaces, with a thoughtfully appointed combination of his/hers closets with open hanging, shelves, enclosed storage and a center peninsula. A thoughtfully designed closet in a timeless finish creates order and maximizes storage in a shared space. 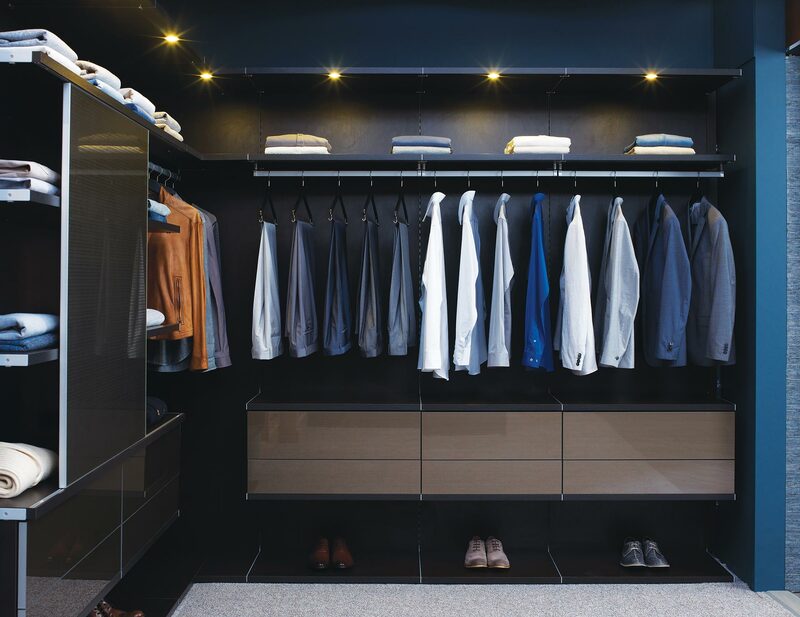 A fresh and modern color palette with accent cubbies and dramatic lighting showcases this client's ever-evolving wardrobe and accessories collection. Classic finishes and subtle details create a large walk in closet that is refined and luxurious but also warm and inviting. A crisp colour palette with glamorous features showcase colorful clothing and accessories. This sumptuous space, complete with a leather-covered centre island, is reminiscent of a high-end men's boutique. Tesoro™ Cassini Beach with Venetian Wenge backing creates a modern, masculine look. Hide leather countertops in Mink add texture to the sleek space. Puck and ribbon lights illuminate the space. Slated shoe shelves with fences keep shoes in place. Double hanging space maximizes storage. Large centre island with drawers and cubbies offers additional storage for shoes and accessories. High-end finishes reminiscent of a posh boutique make this dressing room truly decadent. Virtuoso and Classic system in White create a modern look. White slab drawer faces offer a seamless aesthetic. Sliding door with Hollywood Silver Ecoresin and custom back-painted glass offers an artistic accent and conceals clothing. Puck and ribbon lighting illuminate the space. Crystal decorative knobs add a luxurious flair. Fluted Aluminum poles offer space for hanging clothes. European-inspired Virtuoso creates a modern feel. Lago® Roman Walnut finish lends a masculine look. Modern brushed Nickel handles add a sleek accent. Puck lighting offers a soft glow. Full overlay slab drawer fronts create a seamless look. European-inspired Virtuoso creates a modern, minimalistic feel. Lago® Venetian Wenge finish lends a masculine look. Aluminum sliding door with Celsius Bronze mirror insert conceals clothing. Wired Bronze gloss drawer fronts add texture. Puck lighting offers a soft light. Aluminum poles and accessories add light accents to the dark colour palette. 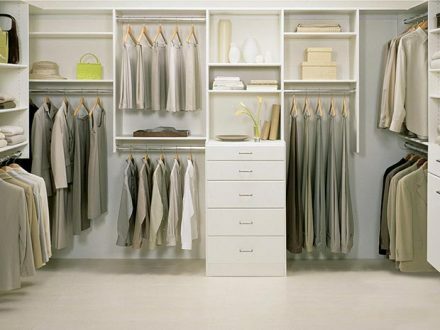 This simple floor-to-ceiling white walk-in closet makes use of every inch of space, yet still feels spacious. 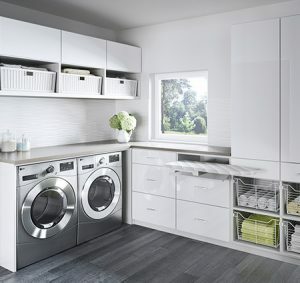 Classic White finish creates a clean, modern look. Slab drawer fronts add to the simple and modern feel. Matte Aluminum round poles hold hanging clothes. Floor-based system with toe-kick finishes the built-in style. Coordinating Bellissima White countertop creates a seamless aesthetic. 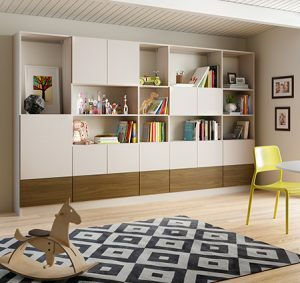 Minimalist design offers elegant yet straightforward storage and organization. Featuring backing, a built-in toe-kick and a centre island, this multifunctional design allows for superior organization. Lago® Venetian Wenge finish creates a masculine look. Modern slab door and drawer fronts. Acrylic shelf dividers keep clothing and accessories organized. Puck lighting softly illuminates the space. Oil-rubbed Bronze belt, tie and valets keep accessories in place. Coordinating countertops create a seamless look from cabinetry to island. Glass shelves display clothing and accessories. A perfectly appointed storage solution, incorporating multiple organizational features, offers unparalleled artistry — and essential order. 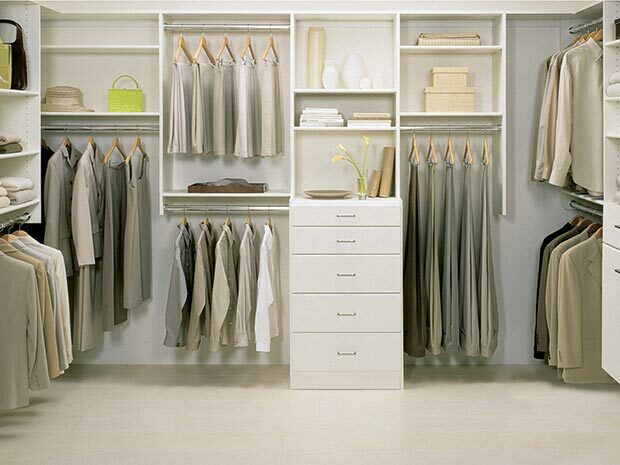 Virtuoso Closet in Lago® Bellissima White creates a crisp, modern look. Aluminum frame sliding doors offer functionality and ability to conceal clothing. Back-painted matte glass inserts in Charcoal add contrast and texture. Push-to-open hardware provides ease of use. Matte Aluminum fluted poles create hanging space for clothing. Symmetrical design details and a single-height hanging pole brings balance to the room. 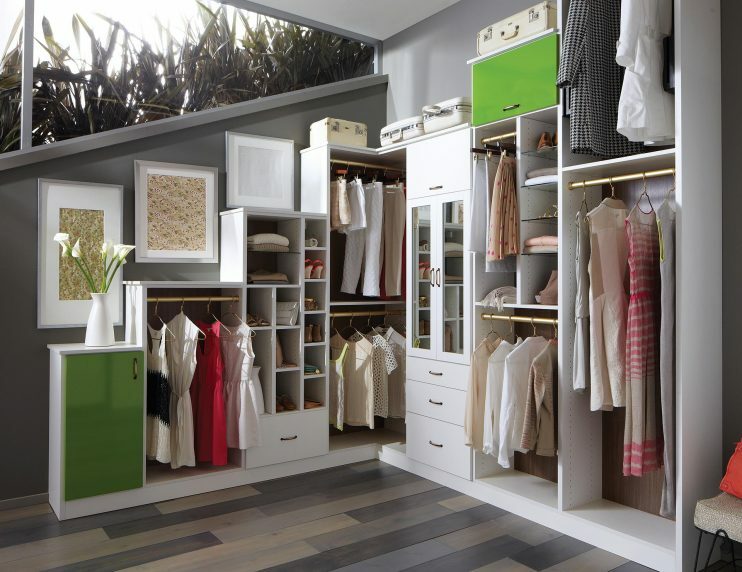 Angled closet with chic green accents maximizes an odd space, making asymmetry part of the unique, functional design. Lago® Bellissima White with Roman Walnut backing creates a fresh look. High-gloss acrylic Parapan doors in Kiwi Green add a touch of colour. Flip-up door hardware maximizes accessibility and space. Lago® 5-piece Shaker doors with mirror glass inserts complete the dressing space. 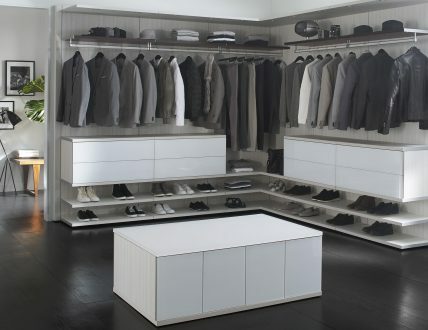 Bellissima White slab drawers conceal select clothing and accessories. Glass shelving displays clothing and accessories. Multiple-height hanging poles accommodate all types of clothing. Tiered top shelf height to accommodate for the ceiling height. Featuring extensive double hanging space and polished details, this modern design is both simple and elegant. Classic White finish in thick 1" + upgraded material offers a bold look. Floor-based system with toe-kick finishes the built in style. Sleek, modern design creates a spacious look. Slab fronts and sleek decorative hardware add polish. 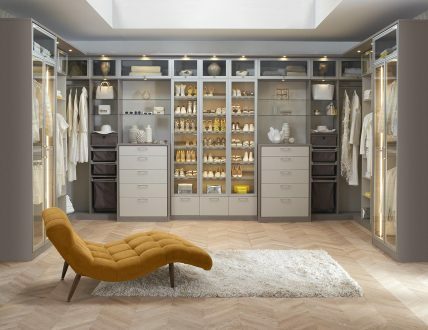 The ultimate luxury space, this high-end walk-in closet features lighted shoe storage and an island with built-in seating. Virtuoso and Classic construction create a modern, luxurious look. Lago® Venetian Wenge and Tesoro™ Cassini Beach finishes offer a touch of drama. 5-piece Traditional doors and drawers with clear glass inserts display clothing and accessories. Sable Chroma countertop offers dressing space. Hide leather shelves and pole covers in Mink finish add texture. Centre island bench offers a place to sit. Oil-Rubbed Bronze aluminum frames with Sirocco printed glass complement the dramatic palette. Aluminum sliding doors with Satin glass inserts create a seamless look. A glamorous white walk-in closet — designed for actress Tiffani Thiessen — spotlights an incredible shoe collection. Classic White finish creates a modern look. Bellissima White 5-piece Shaker doors with Satin glass inserts display shoes. LED lighted back panel offers a boutique-like look. Back-painted glass countertop detail adds to the sleek glamour. Polished Chrome shoe fences hold shoes in place. 5-piece Shaker drawer fronts offer clean lines for a polished look. With a soft palette and rich textural details, fashion meets function for a walk-in closet that feels like a personal boutique. Tesoro™ Linen and Corsican Weave finishes create a soft colour palette. Matte Aluminum doors with clear glass inserts display shoes and accessories. Matte Aluminum hardware adds polish. Two built-in chests with drawers, pull-out baskets and hampers offer concealed storage. Lighted shoe storage, lit closet side panels and overhead ambient lighting offer a boutique-like feel. LED technology offers energy-efficient lighting. Waterfall countertop edge detail and modern top cap trim create a built-in look. 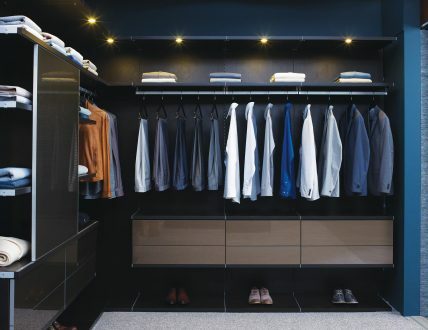 White, high-gloss surfaces and flat drawer faces create a sleek, contemporary walk-in closet that showcases every style essential. Tesoro™ Tuscan Moon and White Gloss finishes create a light colour palette. Lago® Milano Grey accents add a dramatic element to the design. European-inspired Virtuoso design offers a sleek style. Centre island with White Chroma countertop creates a seating area. Recessed round Matte Aluminum puck lighting offers light in just the right places. 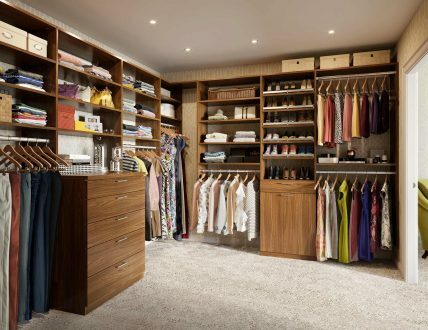 Generous hanging space and well appointed shelving make this walk in closet feel exceptionally open and tranquil. Classic White finish creates a modern and serene space. Round chrome poles and decorative hardware add a touch of interest to the design. Slab drawer fronts offer simple, clean design. Coordinating countertops provide extra space to display belongings. Adjustable shelving allow for flexibility as space needs change. Chic and timeless with textural finishes and open displays, this system beautifully highlights a dream shoe and handbag collection. A warm finish, deep drawers, and elegant details adds style and a sense of luxury to this simple walk-in design. 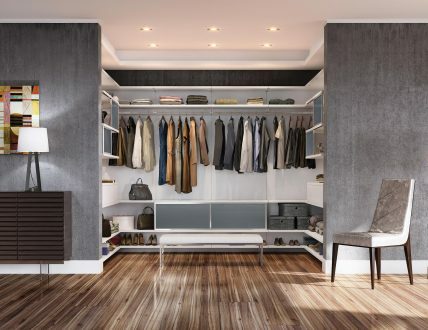 Bring organization to your closet with custom features that create a designated place for every item.